There are two different types of shows during the youth market weekend: breed animals and market animals. Breeding animals are females who will go back to the farm to be mothers to more stick. Market animals are castrated (neutered) males who will leave the fair bound for slaughter. 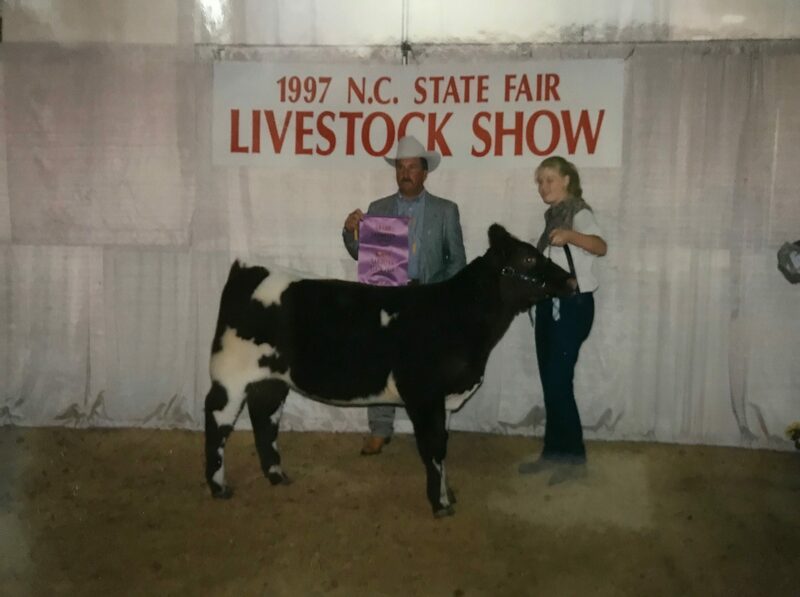 As a youth, I participated in both market and breeding shows. Like most families, the bulk of the breeding animals were raised on our farm and a few were animals we purchased. Breeding animals are long term investments; they require decisions to be made about matings, offspring, and feeding to ensure the animal doesn’t get too fat. My last year to show in the State Fair junior shows, I was able to show a great-great granddaughter of my very first show heifer. That was 10 years of breeding, time, and thought invested into one animal. On the flip side, the bulk of market animals are purchased, and not raised by the youth showing them. Animals can be purchased a year to six months in advance of the State Fair. Market animal projects are great for families who don’t have a lot of land to raise breeding animals. While it may sound callus to invest time into an animal destined to slaughter, the great majority of youth exhibiting a market animal know the animals purpose and destination. As a child, my mother was very vocal that we “didn’t name meat.” We weren’t allowed to make an emotional investment in the market lambs and steers because they weren’t coming home after the State Fair. Market animals are sold at auction, with sponsors purchasing the animals and the money going to the youth exhibitor. 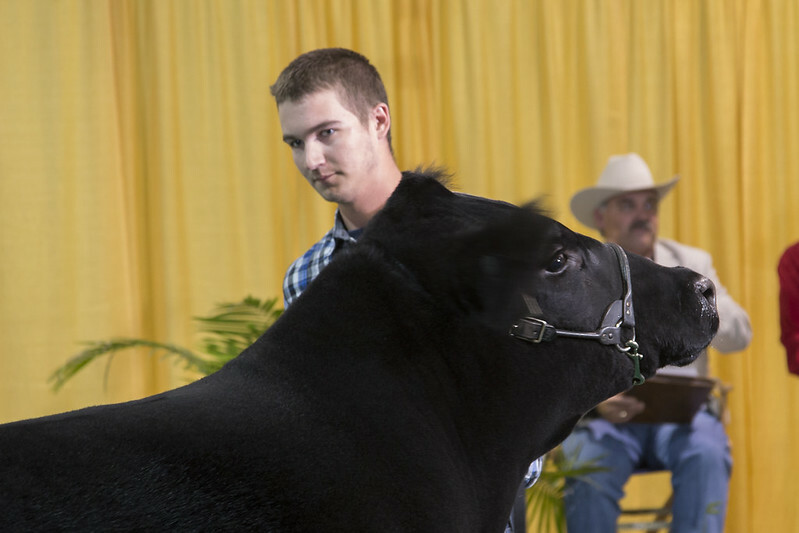 Champion animals are auctioned individually at the Sale of Champions. The youth owner keeps 60% of the auction funds, and the additional 40% goes into a scholarship fund. 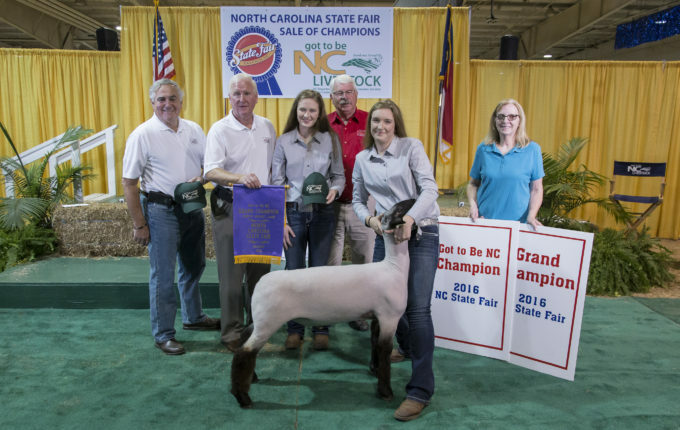 Any youth who exhibits animals at the NC State Fair is eligible to apply for scholarship funds to assist with their college education. 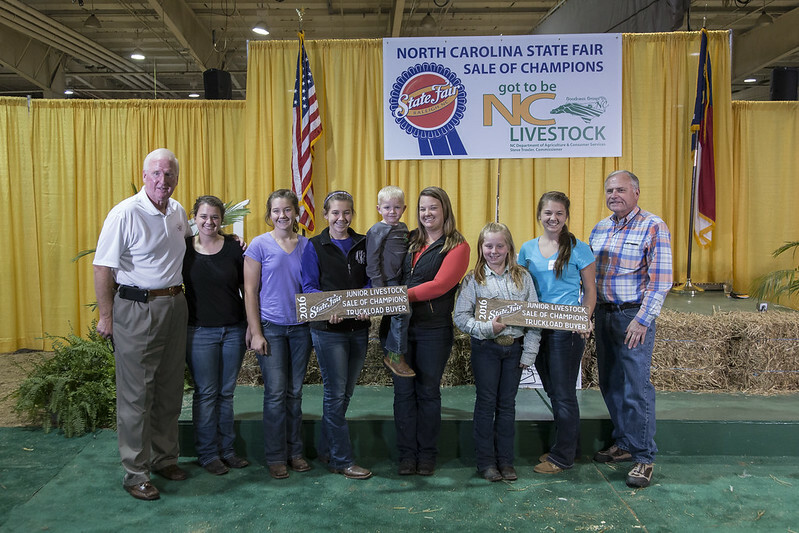 The NC State Fair was my first introduction to NC Farm Bureau, as they were annually the purchaser of the market lambs my siblings and I exhibited. Farm Bureau, along with other organizations and individuals, spend hundreds of thousands of dollars purchasing youth livestock projects. So how do those animals get to be Champions? It all starts with families arriving at the fairgrounds as early as 3 or 4 am. To be ready by the time shows start at 8 and 9 am, animals have to be washed, their hair blow dried, fed, and watered. All of this is done before the youth and families eat breakfast. But, it’s not just about the animal. The youth exhibitor is what makes the event happen. There’s really no way to describe the feeling of the mulch and shavings under foot. The butterflies before you walk in the ring, looking your animal partner in the eye, and knowing you both look good. So why do it? Why invest the time, energy, money? As a youth, there’s nothing like the bond you develop with your animal. Knowing the early mornings, late nights, and all the hard work and practice culminated in placing higher than you expected. It’s knowing that your barn friends are always there for you, even when you placed lower than expected. It’s looking forward to four days of the year, and not wanting them to end. It’s being so tired, you fall asleep during a meal, but so excited you don’t want to leave and go to the hotel. It’s about putting someone else first, and knowing the animals fully trust you to provide all they need. It’s trusting them to cooperate when you’re outweighed up to 8 times your own body weight. It’s about making decisions that are the best for you and your animal. It’s time with your family, and knowing it’s their opinion that matters most. 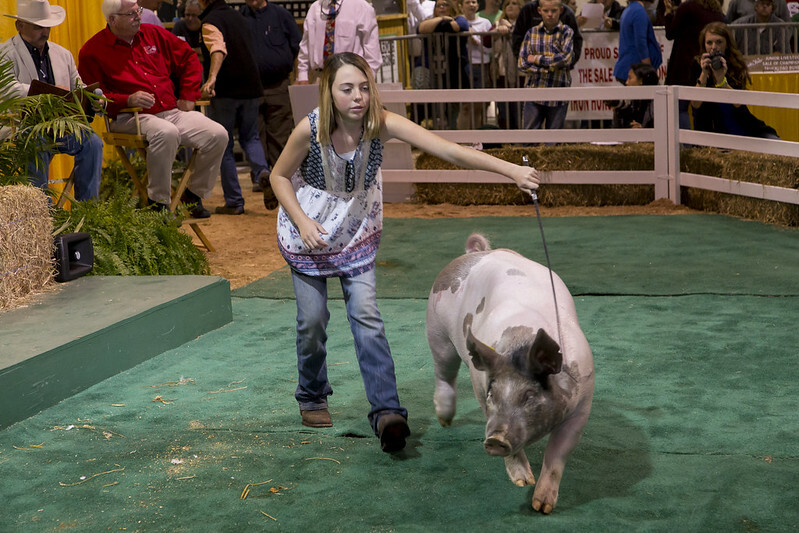 As a parent, I hope my son has the opportunity to participate in youth livestock events. I hope he is able to experience selling his animal. I hope it’s an opportunity for him to learn how to go through the grieving process in a healthy way. I hope he can walk away knowing he gave that animal a great life. He was kind, he provided food and shelter, and he also provide a healthy, high-quality food product to another family. I hope he’s so busy working on our farm and with animals that he never has time to hang out with the wrong crowd. I hope that he makes friends, and they look forward to seeing each other, not just to play, but to work hard. I hope he learns to love the State Fair in his own way.